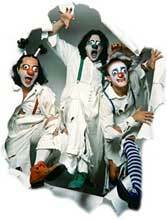 ...Ones upon a time MIMIKRICHY clowns group has been established in Kyiv, Ukraine, mid of 80th. Their international biography greatly altered when the two directors created the "Moscow Lights" program for the Hamburg’s (Germany) stages (1989). During this time, the clowns were winning more and more competitions within the former Soviet Union. One of the climaxes to their careers was attending the First International Variety Festival in Stuttgart. MIMIKRICHY won the first German Variety Prize in Gold. In addition to their joint program ("Moscow Lights"), MIMIKRICHY began to appear with its solo programme. Offers for this grew and grew. Since 1991, MIMIKRICHY has only appeared as a solo. Guest appearances followed in different countries such as England, Italy, Spain, Switzerland, Austria, Holland and Belgium. And everywhere, their appearances met with success. The group had been worked with such scene stars as Kim Waild, Mini-Max, Gina Lolobrigida, Prince, Dimitri, Olli, Kolombaoni, Slava Polunin, etc. In March, 1998 actors and technical stuff left Mimikrichy; the new Plastic Comedy Theatre MIM-I-RICHI has been created. New actors join the theater and together, they are successfully developing elements in the program further. Great novelty is being shown on the stage and their enjoyment of their work continues to be evident. 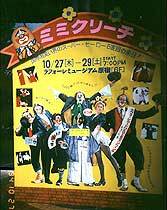 The Pantomime & Clowns Theatre «MIMIRICHI» performs solo with a great success in Europe and also in Japan, Hong Kong, South America (Chili, Brazil), and USA. 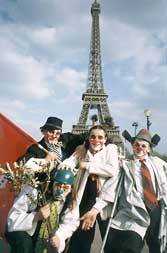 1997: International Aroza’s Humour Festival (Swiss), Chili - under definition of journalists; The Best Foreign Group.